While it is true that Volusion is a site-building service, it can be much more than that, too. Geared more for ecommerce as opposed to blog and wiki online projects, Volusion offers other services and tools to help your business succeed. Located in Austin, TX, Volusion, Inc. has positioned itself well by delivering a complete online store builder and 24/7 live U.S.-based support, resulting in over $18 billion in sales—four times higher than its competitors’ sales revenue. Don’t bother looking for a dictionary definition for the meaning of Volusion. You won’t find one. Based on my experience with the company, Volusion means delivering your customers more quality services than the competition. One example of this is the My Volusion full-featured account management portal. It is devices such as this that put Volusion in a slightly different category than other Web builders. Right off the bat, it is evident what type of online project would benefit the most from a Volusion website. With a specialization in ecommerce, this company caters to businesses of all sizes. You will find some very popular tech companies and major universities running Volusion websites. Even the website of the local Italian restaurant in my neighborhood is powered by Volusion—no kidding! Most of the testimonials on the site speak to the company’s ability to take small businesses to the next level. Customers would rather pay for Volusion’s experience and expertise to get the job done quickly and professionally as opposed to spending time that would be better spent on the daily operations of running their business. I personally find Volusion website designs to be clean and modern, making them ideal for practically any business. Also, an eBay integration and other marketing tools work to showcase your products to more online shoppers. You do want to reach more customers, right? This is not a do-it-yourself service. Yes, you will get to add your products to your online store and you can customize some of the templates. However, Volusion’s services go well beyond that. This is a full-service ecommerce solutions company that happens to offer Web building and hosting services. You won’t find a lot of free Volusion templates. That is okay, though. The free ones are still sharp-looking. Plus, you are going to be adding your own logo, images, and products which is going to customize it somewhat, anyway. 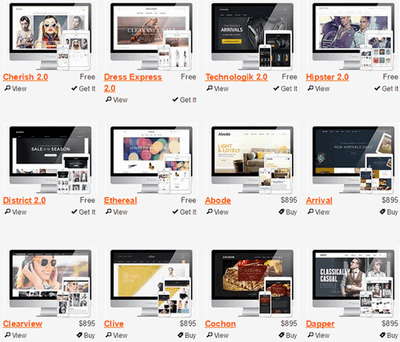 Beyond that there are premium Volusion themes ranging from $50 to $895. If you are working on a shoestring budget, you might have to settle for one of the free templates. I do like the template design quite a bit. I find it to be classic, modern, and functional. If you need to produce a mobile version of your site, the Volusion responsive templates work great on all devices. Be careful, though. Not every template comes with mobile capabilities. One of Volusion’s customers is a restaurant around the corner from my house. I tried to order takeout and needed to use binoculars to see the menu on my phone. They sure could have benefited from a mobile-responsive template. Once you’ve chosen, you can customize the color scheme and design of these templates to match your preferences and add branding opportunities such as your logo to really spotlight your brand and business.I found that the Volusion Web builder was very straightforward and highly intuitive. I must say that you can add a lot of product details. Because of that, it can be very labor-intensive if you take advantage of every option available to you. The design is very clean, making it easy to navigate—both on the build side as well as on the storefront. With the robust Volusion POS (point of sale), users can quickly create and complete orders from a back-end admin area. A great resource is the knowledgebase. Any time I had a problem getting something to work properly, I was able to find the answer quickly. There is a massive, searchable Volusion wiki in the support section. Between that and the Volusion blog, any speedbumps were easily navigated. 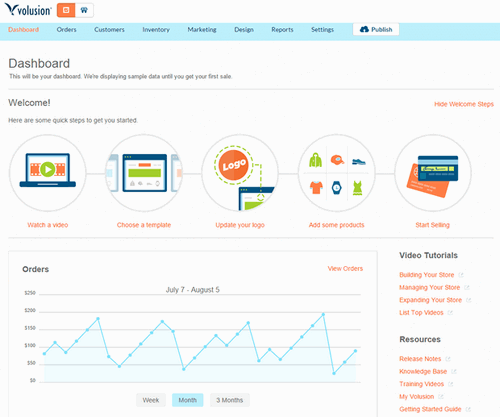 In general, the Volusion builder, back-end, and storefront are fairly easy to use. 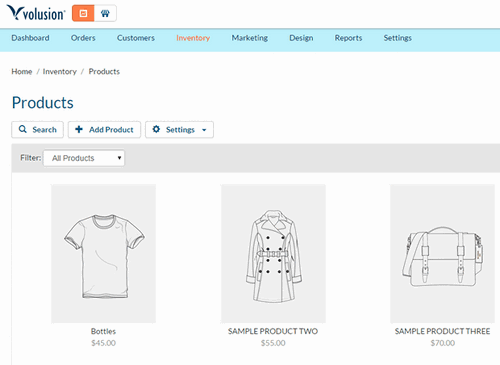 That said, there are so many options that it can be a bit time consuming, especially to create consistency with inventories (e.g., adding product descriptions, images, weights, and sub-categories). The result, though, is a very thorough online store that cannot be replicated with bargain-hosting Web builders. For its Web hosting plans, Volusion pricing is very straightforward. The company offers four different levels ranging from $15 to $135 per month. All of the plans come with unlimited storage and no transaction fees. Also included is the My Volusion account management site, social media tools, a Facebook store, and automated tax rate calculations for customer purchases. I found a few Volusion coupon codes offering anywhere from 5- to 50-percent off some of its services. Not all of these were intended for the hosting fees, though. There is a bit of a misconception that I discovered during this review regarding Volusion gift certificates. There are no gift certificates to redeem as a customer. However, as a merchant, you can offer and redeem gift certificates in your online store. As noted, Volusion offers many tools and services beyond hosting and Web building. These all include an added charge. Marketing, SEO, and analytic tools, as well as many design templates, can be pricey, depending on your budget. Check the website for current costs. Depending on the design template that you use, Volusion mobile pages look great and are very responsive. I found that the Volusion plugins performed well on a variety of mobile devices. You can even create a sitemap for your mobile page to enhance your customers’ experience. One cool feature that I have not experienced with any of its competitors is the Volusion mobile app. Not only can your customers shop on your site thanks to a mobile-friendly page, but you can manage your store from your phone or tablet. The company even offers a smartwatch app! The news section of your My Volusion page will also update you to any new developments that can support your mobile store. Ecommerce is where Volusion shines. It’s not just what the company does best, it’s simply what it does. Volusion ecommerce tools and services are the driving force of its business. Most quality Web builders have ecommerce capabilities. However, few can compare with Volusion’s store and merchant services. From the payment gateway to ecommerce analytics, I have not found a more complete ecommerce solutions provider. I had no trouble managing inventory, processing orders, and accepting payments through the PayPal gateway. Volusion has a lot to offer, but it also can cost a lot if you are going to opt for it all. I do like the Volusion Experts service. This is a go-to resource to have your questions answered by business experts, marketers, developers, and designers. Right now, the experts service is only a beta test; hopefully, it sticks around. Because of that, I can’t include it as an official benefit. For the most part, I really like Volusion. There are a few areas where they could stand to improve, though. Ease of Use: The store builder interface is very easy to navigate. No Transaction Fees: You keep more profit in your pocket! SEO Tools: While costly, they produce results. Cost: Premium services can be very expensive for a small-business owner. SSL Certification: Should be included and not an expensive option. Volusion Tutorial: You learn where things are, but not how they work. One of the primary features that the company promotes is Volusion’s customer service. Support comes in many forms. Based in Austin, TX, there are live representatives available around the clock. Volusion live chat operators are well-trained and can answer your question quickly. You also get a dedicated account manager that is as intimately familiar with your online store as you are. I like the fact that there is a blog section on the help page. Between that and the knowledgebase, I was able to discover tips and workarounds. Volusion support includes a status update section that notifies you if any systems are not functioning properly. If you receive a notification, you will be directed to contact your account manager or a chat representative for assistance. You have to love the proactive performance monitoring. Most Web builders I have reviewed offer little in the way of SEO tools, beyond including some advertising credits as a benefit of their hosting plans. That is not the case with Volusion SEO. The design of its pages help to build website and brand awareness resulting in return business. The unfortunate aspect is that anything past that is not included with the monthly hosting cost. Volusion fees for SEO plans can run from $849 to $2495. The plans include keyword research, optimized content, and Volusion Google Analytics. All of these ecommerce tracking tools are designed to work ethically, consistently, and transparently. 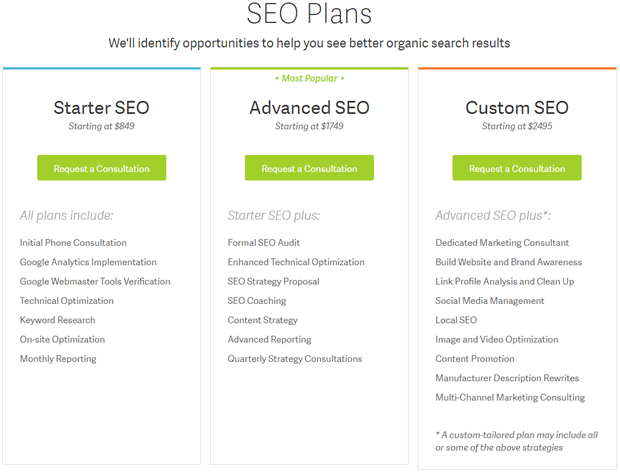 I particularly appreciate the SEO audits ($450 and $799). More of an educational tool, the SEO audit can identify issues and maximize performance. Truthfully, if you can afford it, the SEO services offered can really help to grow your enterprise. The company claims that in six months, its SEO customers’ organic traffic increases 96 percent. That’s impressive! Customers have four different Web hosting plans available to them, each with some basic options such as unlimited storage and no transaction fees, plus premium options like priority support and customer relationship management (CRM) software. Unlike many bargain-hosting providers, Volusion domain names are not free. Domain names cost $11.99 per year. I do like that you do have control over the domain hierarchy, though, with the Volusion nameserver system through My Volusion. In addition to buying Symantec, GeoTrust, or Thawte certifications, customers can purchase Volusion SSL as an added service. With the company’s expertise found more in its ecommerce and SEO services, its hosting is solid, but not extraordinary. Of course, your online store comes with email. The My Volusion page gives you access to the email settings. In fact, with one login, I was able to jump right into the My Volusion page. Here, I was able to create, monitor, and manage multiple Volusion email accounts. Another nice feature that I found in the knowledgebase was how to link my personal email to my Volusion mail. With that, I can check my Volusion webmail from my smartphone, making it easy to stay on cenetr of customer communication. I did see a few older reviews that knocked the templates, but in early 2015, the company introduced new themes. Volusion reviews from 2015 seem to have taken notice, judging from user feedback. The typical review also applauds the company for its impressive client base and revenue funding. Volusion is an impressive option for Web building and business solutions. There is a lot to take in and some of it can be costly. That’s where the Volusion free trial comes in! The company lets you try its services for free for 14 days, with no credit card needed. I signed up for the Volusion demo and checked it out. Once you create the account, you watch a video that walks you through the process to set up your online store. At a minute long, it is not too informative, though. I selected one of the free templates, created a logo, added some products, and was ready to sell. Of course, you can get much more detailed with some of its premium services. However, the free trial is a great way to dip your toes into the pool. My final verdict is that Volusion offers amazing ecommerce and SEO services that may or may not be great for your business. Smaller businesses with financial constraints might not be able to afford some of the premium tools. The Mini hosting plan for $15 a month only supports 100 products. Businesses with larger inventories that also enjoy a consistent stream of revenue could conceivably afford many of Volusion’s high-end SEO packages. Based on the company’s claims, that investment in the business could pay huge dividends. The question is whether or not you can afford it. In my opinion, Volusion is a solid play for any online store with over 1,000 units of inventory that is looking to capitalize on Volusion’s savvy Web marketing techniques.